When a try is scored in top flight rugby, most of the attention goes to the team that has just scored, for obvious reasons. The TV director hones in on the scorer as his team-mates flock around him, then he shows clips of fans celebrating especially when it's the home team, and finally we see endless replays of the move that led up to the score. If the scorer happens to do a swan dive as he dots down, we are 'treated' to it in slow motion a few times for good measure. But what of the other team? What are they up to while all this excitement is going on? Well we know what they do physically, namely congregate under the posts awaiting the conversion. You would think what happens between them in that time could be narrowed down to three general categories...stunned silence, playing the blame game among themselves, and dusting themselves off to find a way to fight back as soon as possible. 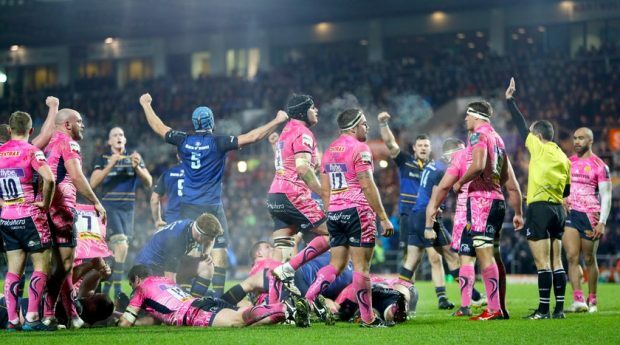 I reckon Leinster have to be among the best club teams in the world for not only sticking to that third category, but also implementing whatever plans they hatch in that time. I have no statistical proof of this, nor do I have time to crunch the numbers for my beloved province over the years, let alone all the others to make a comparison. My evidence is purely anecdotal from approaching a decade of harping on the province, and we had a perfect anecdote on Sunday evening at the home of the Premiership leaders and reigning champions. As James Short was diving over the Leinster line on 54 minutes, it had to put the home side in a confident mood. Their three-time European champion visitors had enjoyed most of the possession up to that point, we had held them out a couple of times on our own try line either side of halftime, and we had even seen out a ten-minute spell with a man down thanks to a series of time-killing techniques, mostly around the lineout area. Of course we'll never know for sure what was said under those goalposts as Gareth Steenson was missing the conversion, but what followed was an absolute masterclass in professional rugby tactics and execution. To put it in its most simplest terms, we first beat them at our game, then we beat them at their own. The tactical importance of box kicking in modern Irish rugby has been transformed in recent years. It used to be something of a last resort - look, we're getting nowhere here lads, let's put this thing up in the air and let the chips fall where they may. Not anymore. When the likes of Conor Murray and Luke McGrath hoist one into the sky, it's all about getting the ball back, not giving. Already in this match there had been bouts of box kick tennis - clearly Exeter were trying a spot of the whole 'beat em at their own game' themselves, but for the most part we were able to handle it. Yet when the score was level we ramped up the pressure specifically on their right wing, and a combination of hang time, accuracy, solid chasing and good tackling made it too much for them. Nic White dropped one, Jack Nowell did too, and even when Olly Woodburn came up with the ball, he was under so much pressure that his clearance kick skewed into touch on the full. But that was only half the battle...maybe we've managed to kick and chase our way into a good field position, but do we have a plan to back it up with a score? After watching virtually every minute of rugby the Chiefs have played this season, the above was the essence of my 'scouting report' on them. They have picked and gone with the tactic of 'pick and go' and their record to this point showed it works. Well not only did we borrow that plan for ourselves, if anything we improved on it. In two bruising series of phases deep in Exeter territory, first an already amazing 32 and then a stupefying 44, made up of endless low-trajectory burrowing carries along with several longish passes to runners on hard lines, with not one drop. That looks like a typical 'top 5' list for a team that has had a tough eighty minutes of tackling, right? Well what you see above is actually list of the top five tacklers from Exeter's bench. Meanwhile Leinster's leading tackler on the night was Sean O'Brien with, wait for it, 12. Yes, twelve. And one other stat that stood out...rucks formed by Leinster, 164. Of those, rucks won by Leinster, 164. With fingers crossed behind my back on one hand and the other ready to furiously knock on wood, those are title-winning numbers. I could praise individuals at length if I wanted...Sexton and McGrath for the precision kicking, Nacewa for his composure in taking the penalty which put us back ahead as his outhalf was receiving treatment, our 'Henrose' centre pairing for overall defensive coverage barring one slip ahead of the Short try, McFadden for his incessant desire to make something happen, Jack Conan for crashing over on phase number 45...but too much of that would take away from what was an amazing away European display that stands as much to the coaching as it does the 14/15 players in blue that were on the pitch at any one time. There is need to single out one Leinster player, however. In writeups so far this season, we have heaped praise on players like Isa, Sexton, Ross Byrne, Luke McGrath, last week it was the new boy James Lowe...and in each case it was much deserved. But more than once I have had to add a line that goes something like : 'Honourable mention has to go to Scott Fardy'. I think it's time to upgrade those mentions a tad. 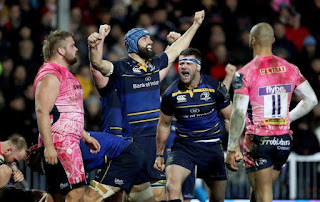 Apart from some lineout yips which, for the most part, are getting better, the Leinster pack has done extremely well this season, especially in the scrum. And more often than not, right at the heart of everything that is going well for us in the forwards is our Wallaby flanker-turned-lock. Taking lineouts, making carries, clearing out, mixing it up at the breakdown, we already knew he could do this from his test career and also that he seemed more than happy to get it done away from the spotlight. Our first European success was largely thanks to the addition to our ranks of another Australian known for wearing six on his back, and while Fardy is a different kind of player, his importance both on and off the pitch for us cannot be overstated. Having the confidence to trudge through 30- and 40-plus sets of phases needs leadership and he has it to burn. Has he had a man of the match award so far this season? As I write I'm not sure but he's definitely my Leinster player of the season so far. Now, to Monseiur Romaine Poite. I have mixed feelings. Of course as I watched the match live it looked to all intents and purposes that he was going out of his way to make every contentious decision go against us. But seriously, what avid sports fan DOESN'T see things like that? On his handling of the Leinster 'tries that never were' in the early stages...I always thought there were two questions a ref could ask the TMO, namely 'try or no try?' or 'any reason I can't award a try?'. Poite seems to have invented a third : 'Just a quick check to make sure it wasn’t in touch before he pass the ball the number 10 blue please’ and from there you'd swear the intent was to keep looking at replay until they found a way to rule out the score. Right, that's enough on the ref...this is not a writeup that should carry too much negative. Results across Europe made the Premiership look very humble over the weekend, but there was something about this Leinster performance in particular which blended well with all the festive vibes increasing on a daily basis at this time of year. 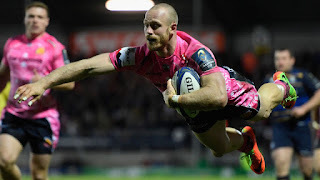 We felt ten points from our first two matches was over and above what we hoped for, and at Sandy Park on Sunday night, a 'four-zero-split' was that again. This of course puts us in a strong position...six points clear atop the pool with two home matches to come before we travel to Montpellier. Naturally we'll need to back this up with another solid outing at the Aviva next Saturday...we've been burned on our own patch by Premiership teams before after impressing away from home. And hopefully the injury to Rhys Ruddock isn't as bad as it seems to be...he's another who has had an impressive campaign.